Press Release: 2014 Breast Cancer Song Announced 100% of downloads go to charity! The National Breast Cancer Foundation is the leading community-funded organisation in Australia raising money for research into the prevention and cure of breast cancer. Since NBCF was established in 1994, over $105 million has been awarded to more than over 370 Australian-based research projects to improve the health and wellbeing of those affected by breast cancer. 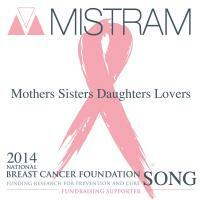 2014 Breast Cancer Song Announced 100% of downloads go to charity! The track was recorded and mixed compliments of Tall Poppy Productions one of Brisbane’s best indie recording studios. The band will be attending several NBCF events throughout October with the finale being their live performance alongside some of music’s greats at the Airlie Beach Music Festival November 7th, 8th and 9th. Ms Carole Renouf, NBCF CEO, encouraged Australian radio stations to support MISTRAM and the song in an effort to help raise as much awareness as possible and encourage downloading. “Every MP3 download helps take NBCF one step closer to our goal of zero deaths from breast cancer by 2030. We’ve made significant progress since 1994 but, the work is far from over. We’re now striving to accelerate the delivery of research results to reach zero deaths by 2030 and reduce the suffering caused by breast cancer, and we can only achieve this with the help of fundraisers like MISTRAM,” said Ms Renouf. NBCF is Australia’s leading community-supported organisation dedicated to funding high quality research into the prevention, detection and treatment of breast cancer. When NBCF was founded in 1994, 30% of women diagnosed with breast cancer lost their battle with the disease. In 20 years, this figure has halved. This achievement is primarily due to research – the most effective way to improve the prevention, detection and treatment of breast cancer – and the support of community fundraisers like MISTRAM. For information about MISTRAM the Brisbane Band please visit www.mistram.com.